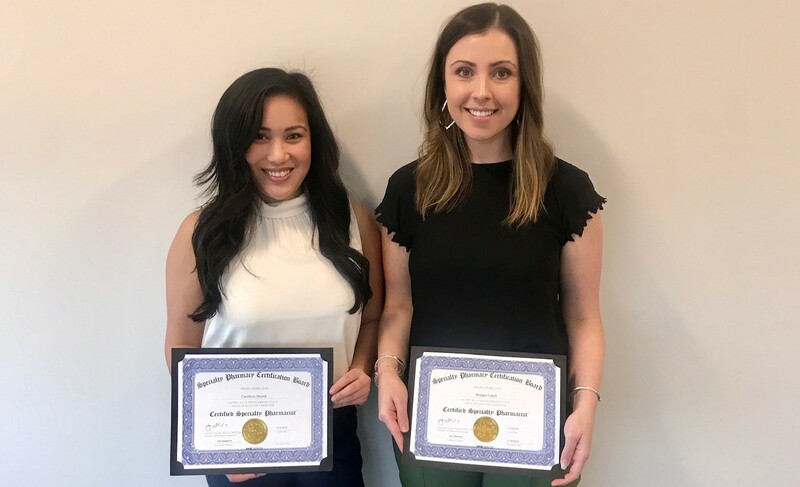 Bridget Cahill and Carol Huynh are the most recent Pharmacists at Shields Health Solutions to earn the coveted Certified Specialty Pharmacist (CSP™) Designation in 2018. Over the past few months, Bridget, a Clinical Pharmacist at Shields, and Carol, the Regional Supervisor of Clinical Services at Shields, have devoted numerous hours of studying and hard work to take the CSP examination and advance to a new specialized pharmacist rank. This certification validates expert knowledge in the specialty pharmacy field, both clinically and operationally. The CSP™ credential validates a pharmacist's expertise in specialty pharmaceuticals, which are used to treat complex chronic illnesses. Certification requires experience: a minimum of 3,000 hours of specialty pharmacy practice, education: 30 hours of Specialty Pharmacy ACPE approved CEs and expertise: validating advanced proficiency passing a comprehensive examination. The certification is presented by the Specialty Pharmacy Certification Board, (SPCB). With their new specialty certification, Bridget and Carol now join three other colleagues at Shields as Certified Specialty Pharmacists – Kate Smullen, PharmD, CSP, Senior Manager of Clinical Services, Nikki Henderson, PharmD, CSP, Senior Manager of Clinical Services, and Brooke Ruhland, PharmD, CSP, Clinical Contracting Specialist. These five women are now part of an exclusive group of Certified Specialty Pharmacists across the country that are on the forefront of integrating clinic and pharmacy care to better service patients living with chronic illnesses. Bridget and Carol's newest designation as CSPs will allow them to better answer the unmet needs of the chronically ill population and fully apply their knowledge and expertise in order to continue to provide legendary care for patients. Congratulations Bridget and Carol from everyone here at Shields for your continuous hard work and remarkable accomplishment!